We've had a big win in Kern County. This is the biggest single county in the USA for oil production. These are big oil producers. They are even BIGGER water producers! They bring up, on average, ten barrels of water with every barrel of oil. California's farmers and residents could sure use that water... but only if it is absolutely clean. We recently proved that we, and our licensees, can do that. Read a sneak preview of our report here. Our technology is on TV! 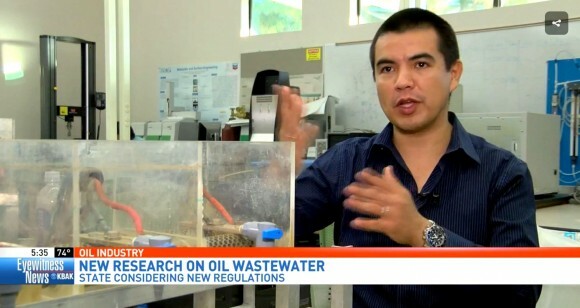 CSU Bakersfield's Professor Luis Cabrales tests water cleanup with the OriginClear system. President Trump and Clean Water. Backed by both houses of Congress, our President-elect favors aggressive expansion of oil and gas production. What's less known, is that he intends to invest heavily in clean water. It's great to know our President-elect supports the water revolution. From Bakersfield, California to Dallas, Texas — We're ready. If you're in the US, have a Happy Thanksgiving... and stay tuned! Like us on Facebook to see our photostream! The securities referred to in this advertisement may be sold only to accredited investors, which for natural persons, are investors who meet certain minimum annual income or net worth thresholds. These securities are being offered in reliance on an exemption from the registration requirements of the Securities Act and are not required to comply with specific disclosure requirements that apply to registration under the Securities Act. The Securities and Exchange Commission has not passed on the merits of or given its approval to the securities, the terms of the offering, or the accuracy or completeness of any offering materials. The securities are subject to legal restrictions on transfer and resale and investors should not assume that they will be able to resell their securities. Investing in securities involves risk, and investors should be able to bear the loss of their investment. Matters discussed in this release contain forward-looking statements within the meaning of the Private Securities Litigation Reform Act of 1995. When used in this release, the words "anticipate," "believe," "estimate," "may," "intend," "expect" and similar expressions identify such forward-looking statements. Actual results, performance or achievements could differ materially from those contemplated, expressed or implied by the forward-looking statements contained herein, and while expected, there is no guarantee that we will attain the aforementioned anticipated developmental milestones. These forward-looking statements are based largely on the expectations of the Company and are subject to a number of risks and uncertainties. These include, but are not limited to, risks and uncertainties associated with: the impact of economic, competitive and other factors affecting the Company and its operations, markets, product, and distributor performance, the impact on the national and local economies resulting from terrorist actions, and U.S. actions subsequently; and other factors detailed in reports filed by the Company.